This entry was posted in rag rug, weaving. Bookmark the permalink. 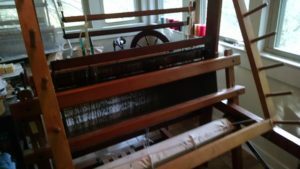 When I tie up my Hammett for rugs, I try to have enough warp for at least 3 and maybe 4 rugs, plus about a yard for loom waste and spacing between rugs. That means that for a 48″ rug, -I allocate about 52-54″, times 4 = 208-216″ for rugs, plus 36″ for loom waste = 252″ or 21′ or 7 yards. But sometimes because my warping board is great for 10 yds, I’ll add on another rug. Thank you so much for answering my questions. 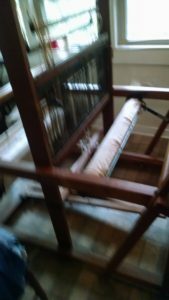 When you transfer your warp to your loom do you use a tension box? I am new to this. I don’t have a tension box. I just chain, and then wind on some warp, go around front and pull straight and tension, then wind again. It’s slow, but it’s the way I do it alone – great to have another person to hold the warp and keep it tensioned! Debbie Reynolds has a great book on beginning weaving. 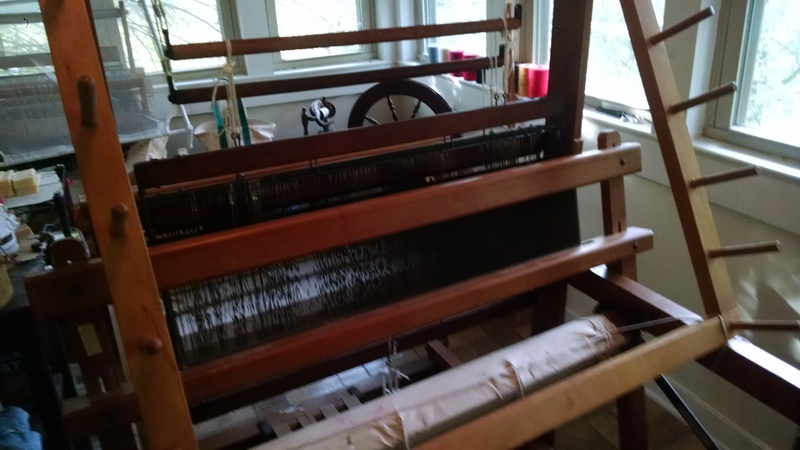 I usually put on at least a 10 yard warp, or 3-4 rag mats’ worth plus about a yard of loom waste.